Sax player Joonatan Rautiola (b. 1983) studied with Pekka Savijoki at the Sibelius Academy and with Claude Delangle at the Paris Conservatory. He came to the attention of the musical community when he won the Young Soloists Competition organised by the Finnish Broadcasting Company in 2002. He also won a prize at the Aeolus Competition in Düsseldorf (2009) and at the Adolphe Sax Competition in Dinant (2010). 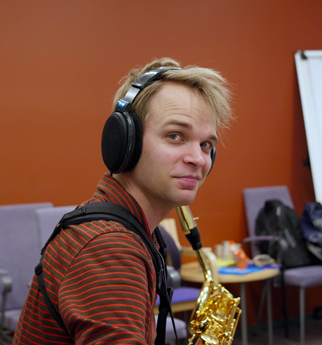 Rautiola specialises in contemporary music for saxophone and has recently premiered saxophone concertos by Olli Virtaperko (2016), Guillaume Connesson (2015) and Tapio Tuomela (2013). He has collaborated with numerous composers from Betsy Jolas to Pierre Boulez, and he has appeared as soloist with the Strasbourg Philharmonic, the Bruges Chamber Orchestra and the Finnish Radio Symphony Orchestra and given recitals as far afield as the Parthenon-tama in Tokyo and Carnegie Hall in New York. He teaches the saxophone at the Sibelius Academy. Apart from his professional activities, Rautiola enjoys singing, literature and nature.